SQL CAST Function helps to modify datatype. e.g. The SQL CAST function can modify or change numeric datatype to character string datatype. Here, the datatype gets changed. The data, data1 and data2 can be either same or different. 2.2 What we learned today about the CAST function? Let us use the following table for explaing these SQL queries related to CAST function. Let us see the data in the table by executing the following SQL Query. 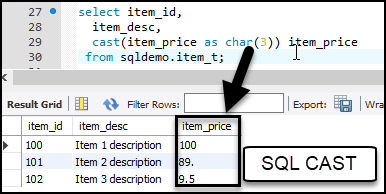 SQL Queries #1: Let us say we want to convert the item_price datatype to signed. This will round up to nearest integer whole number. The result of the above query would be as follows. Please pay attention to the item_price column. The values have lost some data. So it is not advisable. What we learned today about the CAST function? We learned the syntax of SQL cast function. Then we saw how to use the same with the help of SQL Queries.